An Australian woman “jumped off her seat” after being bitten by a snake on the toilet, a reptile handler says. Helen Richards, 59, received the non-venomous strike in the dark at a relative’s house in Brisbane on Tuesday. She received minor puncture wounds from the 1.5m (5ft) carpet python. 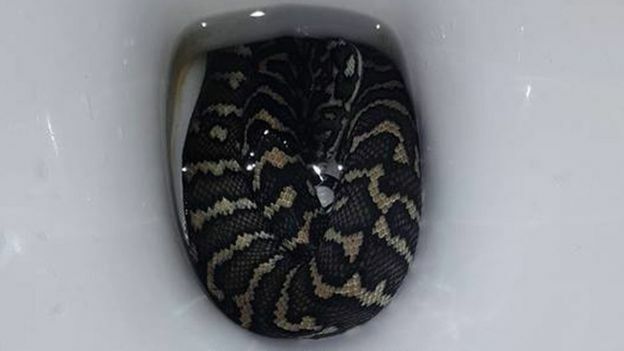 Handler Jasmine Zeleny, who retrieved the reptile, said it was common to find snakes seeking water in toilets during hot weather. Ms Richards told local media she had felt a “sharp tap”. “I jumped up with my pants down and turned around to see what looked like a longneck turtle receding back into the bowl,” she told The Courier Mail newspaper. Ms Zeleny said Ms Richards had treated the minor bite marks with an antiseptic, describing carpet pythons as relatively harmless. “Unfortunately, the snake’s preferred exit point was blocked after being spooked by Helen sitting down, and it lashed out in fear,” Ms Zeleny told the BBC. Carpet pythons are a common species along the east coast of Australia. They are not venomous but tetanus shots are recommended for bites. Australia has experienced a fortnight of extreme heat that has broken dozens of records across the nation. Several wildlife species have suffered, with reports of mass deaths of horses, native bats and fish.